TransReality is a visual application that rhythmically transforms a photo or the camera’s live preview. Enjoy rotating and flashing the sights around you or your favorite pictures. Transformations can be made to be anything from smooth and calming to wild and intense. 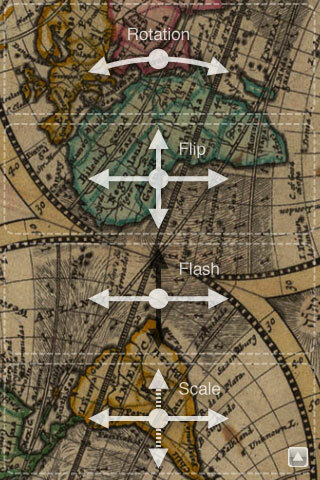 Specifically, this application rotates, flips, scales and flashes the selected image. The transformation can be controlled intuitively by dragging on the screen and stopped by tapping and shaking. – Camera functionality is not supported on iPod touch. – Due to the stroboscopic and rapid transform effects, people prone to epileptic seizures should not use this application. Drag or tap on the four areas of the screen to transform the image. The guidance as below will be shown while you are operating. The toolbar button is at the right bottom corner. (1) Drag to rotate the image. Tap and hold to stop rotating. (2) Drag to flip the image. Tap and hold to stop flipping. (3) Drag to flash the image. Tap and hold to stop flashing. (4) Drag to scale the image. Tap and hold to stop scaling. (5) Tap to show the toolbar. Shake to reset the transformation. You will see the normal view. (6) Open the photo album and choose the picture you like. 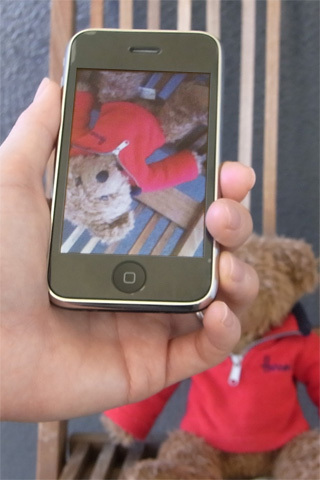 (7) Take picture and store it into the camera roll. The picture will appear after a short time. This button dose not appear on iPod touch. (9) Open the photo album and choose the picture you like. (10) Open the camera preview. This button dose not appear on iPod touch. I want to ask if you are going to make it possible to capture the images, as they are being transformed, into video (3GS). What I mean is be able to record. John, It’s an interesting idea. But I think it would be better to realize it as another application, technically and conceptually.